A long lasting, cost effective design. The SCP Ladder Trap Door is designed to prevent falls from height via internal ladder access points within a Scaffold. Easily assembled by simply fitting the rear bracket over the toe board and quickly secured by tightening the fixed bolts the SCP Ladder Trap Door is a quick, simple and robust solution. The Ladder Trap Door can be secured in the open position by simply flicking the locking tang down. 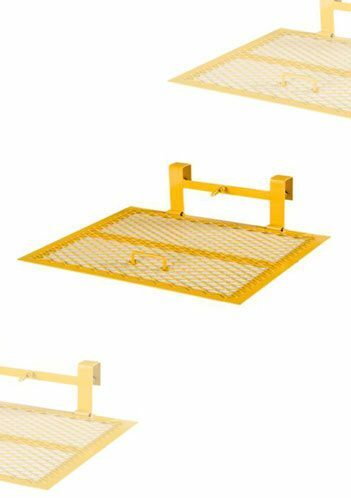 The SCP Ladder Trap Door is the flattest on the market due to its design which uses flat steel strip, welded mesh and it’s “fall through” handle so is therefore the most suitable solution to avoid trip hazards. Yellow Powder Coating provides a Hi-Viz access point and prevents corrosion. Hi Visibility Yellow Powder Coated Finish. Designed to fit a standard wooden toe board.